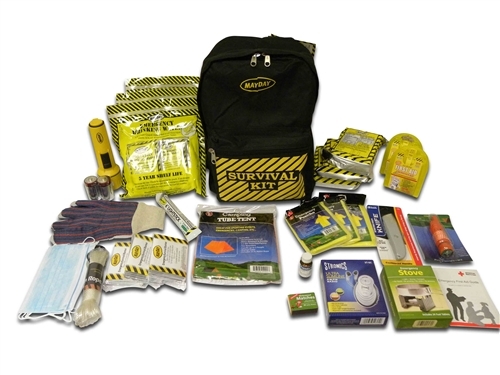 This Survival Kit contains a complete set of emergency supplies including: emergency food & water rations, flashlight, radio, portable cooking stove, a tube tent, water purification tablets, a first-aid kit and much more. The food & water rations in this Emergency Kit have a 5 year shelf life. After 5 years they can easily be replaced with products on our site. Also, should you be stuck in your home, you will be able to use your available water sources with the water purification tablets we’ve included. This vitamin enriched, great tasting food bar is approved by the U.S. Coast Guard and the Canadian Transport Department. It has a 5 year shelf life with the expiration date clearly visible for easily determinable replacement. These bars consists of 2400 Calories which represents a 3 day emergency food supply for one person. Each bar is divided into 6 - 400 calorie segments & requires no preparation. It is safe for vegetarians & those with nut allergies. This ration can be stored in temperatures up to 149 degrees F.
One of these germicidal tables treats a quart of water. These tables are proven effective against bacteria, Guardia, Lamblia, Cryptosporidium, and viruses. They have no after taste and actually improve the taste and odor of water. This bottle treats 50 quarts of water. This slim line AM/FM Radio comes with a headset and carry strap. As an added convenience, a high efficiency LED flashlight is built into the bottom of the radio. Two ''AAA'' batteries are included.